FOLLOWING IN THE FOOTSTEPS OF GREAT NATURE WRITERS SUCH AS E.O. 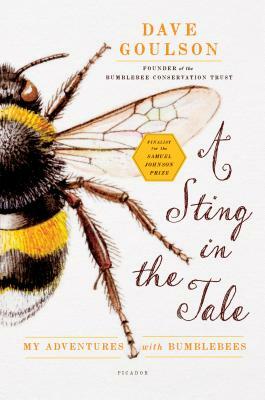 WILSON AND CHARMING MEMOIRS LIKE GERALD DURRELL'S MY FAMILY AND OTHER ANIMALS, THIS FASCINATING BOOK WILL ALTER THE WAY WE THINK ABOUT BUMBLEBEES. Dave Goulson became obsessed with wildlife as a small boy growing up in rural Shropshire, starting with an increasingly exotic menagerie of pets. When his interest turned to the anatomical, there were even some ill-fated experiments with taxidermy. But bees are where Goulson's true passion lies—the humble bumblebee in particular. Once commonly found in the marshes of Kent, the English short-haired bumblebee went extinct in the United Kingdom, but by a twist of fate still exists in the wilds of New Zealand, the descendants of a few pairs shipped over in the nineteenth century. Dave Goulson's passionate quest to reintroduce it to its native land is one of the highlights of a book that includes original research into the habits of these mysterious creatures, history's relationship with the bumblebee, and advice on how to protect the bumblebee for future generations. One of the United Kingdom's most respected conservationists and the founder of the Bumblebee Conservation Trust, Goulson combines lighthearted tales of a child's growing passion for nature with a deep insight into the crucial importance of the bumblebee. He details the minutiae of life in the nest, sharing fascinating research into the effects intensive farming has had on our bee population and the potential dangers if we are to continue down this path. Dave Goulson studied biology at Oxford University and is now a professor of biological sciences at the University of Stirling. He founded the Bumblebee Conservation Trust in 2006, whose groundbreaking conservation work saw him win the Heritage Lottery Award for Best Environmental Project and “Social Innovator of the Year” from the Biology and Biotechnology Research Council in 2010.